Winter is coming – and so are the holidays. While you wait for the final season of “Game of Thrones” to premiere this spring, pick up one of these gifts for fans of the hit HBO show. From stocking stuffers to luxurious getaways, these gifts are sure to impress both ardent fans and casual viewers alike. Catch up on all the storylines, plot twists, deaths and – spoiler alert – resurrections, with this 30-disc boxed set, that contains every “Game of Thrones” episode from seasons 1-7. The set (which is also available on DVD) comes with a digital code for you to stream all the episodes from your devices as well. Purchase: $99.99 on Amazon.com. Ramin Djawadi’s critically-acclaimed soundtrack has spawned concert tours and best-selling CDs, but this Barnes & Noble exclusive captures the sounds of season 7 in a limited-edition two-disc vinyl. Dubbed the “Fire Edition,” this orange and black swirl picture disc includes original artwork and the sweeping score that accompanied some of season 7’s most memorable – and jaw dropping – moments. Purchase: $29.99 on BarnesandNoble.com. The classic board game gets a TV twist as players strategize and battle for the Iron Throne. Claim your right to the Throne with one of seven Noble House armies, while the 28 character cards (four per house) equip you with special skills and abilities to defend against attacks. Exclusive to this edition: a striking game box with silver-foil stamps of the House sigils, and seven personalized Player Boards customized for each House. This limited-edition set contains more than 650 total pieces. Purchase: $58.99 on Amazon.com. This officially-licensed Night King figure from “Game of Thrones” is a ThinkGeek exclusive, and is a perfect addition to a coffee table, bookshelf, nightstand or desk. Measuring 8 inches tall, the limited-edition collectible makes a great stocking stuffer or Secret Santa gift too, whether you’re riding undead dragons or just trying to one-up your friends and colleagues when it comes to holiday gifting. Purchase: $29.99 on ThinkGeek.com. This solid maple and walnut wood cutting board is handmade in Oklahoma, and features a clever take on the “Game of Thrones” tag line. The cutting board comes pre-oiled on one side, with a food-safe oil that preserves and strengthens the wood, while a laser engraved “GoT” crest and slogan adorns the other side. The board is made to order and entirely cut, sanded, and finished by hand. Purchase: $24.99 on Amazon.com. Set the table for royalty with these officially-license “Game of Thrones” table runners. This pack of three table runners contains one each for House Stark, House Targaryen, and House Lannister. The runners measure 72 x 16 inches and are fully machine washable. 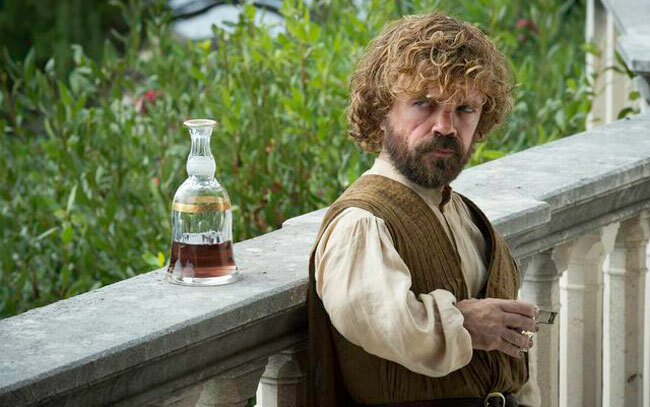 A friendly warning: Don’t use the Lannister runner on the kids table. It never ends well for the Lannister children. Purchase: $64.99 on ThinkGeek.com. Looking for a great stocking stuffer? Grab a pack of these “Game of Thrones” playing cards. The standard-sized deck features 52 cards and 2 jokers, all featuring characters and iconic images from the show. Purchase: $9.99 on Amazon.com. Toast to the holidays – and the final season – by picking up a bottle or two of this “Game of Thrones” win. Produced along California’s Central Coast, this juicy red wine is a blend of blend of Syrah, Tempranillo and Petite Sirah, and features notes of black cherry, brambly blackberry, vanilla and cocoa, mixed with hints of leather, vanilla and spice. Order online to have it delivered to your door in time for your holiday dinner. Purchase: $19.99 on Wine.com. The real-life staircase to Dragonstone is located in San Juan de Gaztelugatxe, an inlet near the Spanish and French border. Want a gift that will truly impress the “Game of Thrones” fan in your life? Book a stay at the Gran Hotel Domine Bilbao, which offers unparalleled views while conveniently placing you near many of Basque country’s most iconic sights. Revisit the land where Aegon the Conqueror flew to Westeros and united the Seven Kingdoms with fire and blood, while touring one of Spain’s most idyllic locales. Purchase: rooms from $134/night on Hotels.com.